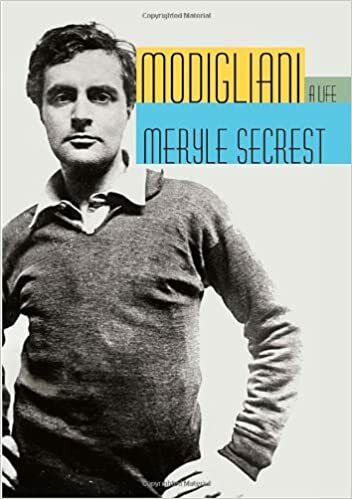 While Modigliani: A Life by Meryle Secrest was not exactly the biography I was looking for, it is an entertaining, educational read that has much to offer both fans of the artist and general readers. Ms. Secrest’s book on Modigliani is not really a critical biography. My loose definition of a critical biography is a book that looks at an artist’s work in an attempt to illuminate how it came to be, to examine how it works, and to evaluate its overall quality. Of course, much of the artists personal life will be covered but it is not the focus of a critical biography. Ms. Secrest covers all of Modigiliani’s life which is her main focus. She does spend plenty of time discussing how he came to be an artist and explaining both how is art works as well as why it is significant, but the life of the man takes precedence. Hence the title, I suppose. It’s an interesting life. If you were one of the many people participating in the recent Paris in July by day-dreaming about being an artist in Paris during the heyday of Monet or Picasso, you will find plenty to enjoy in Modigliani: A Life. Amedeo Modigliani arrived in Paris from Italy, in the early days of the 20th century. He lived among the major artists of his day, became friends with Pablo Picasso, was the center of attention in avant-garde social sets, and lived la vie Boheme on nothing a year. He struggled as a sculptor for years until he found his signature style as a painter. While he never became rich or famous during his lifetime, he did live to enjoy some success before dying at the age of 36 from tubercular meningitis. In Modigliani: A Life you’ll find a rich story of struggles with art, family, women, and day to day existence in Paris of the early 20th century, when the art scene left Montmarte for cheaper quarters in Montparnasse. Ms. Secrest attempts to correct several aspects of Modigliani’s reputation, namely that he helped bring about his own early death through excessive drink and the use of narcotics. She builds a strong case. What struck me most is the idea that he drank as a means to control the symptoms of tuberculosis which he kept secret until just before his death. His fear that he would have been ostracized by just about everyone if his condition became known was probably correct. If, like me, you’re looking for information about his paintings, you’ll find it towards the end of Ms. Secrest’s book. Modigliani was at the height of his skill during the final year of his life. He had been painting portraits of friends for several years, he worked with anyone who would sit for him without pay because he had no money to hire models, but these did not sell. In Modigliani’s day, if the sitter didn’t buy the portrait, no one did. Once he moved on to painting nudes, his work began to sell, and he painted what many argue are his best works. So why is Modigliani not held in the high esteem less able painters like Picasso are or recognized alongside the great painters of his generation like Matisse? Ms. Secrest blames three major culprits. The first is the author’s own personal reputation. Modigliani’s private life was one of near complete chaos which gave him a lasting bad reputation deserved or not. Second, because his work is so easy to fake and because he did not keep accurate records of the work he did, he became one of the most frequently counterfeited artists of the 20th century. For a long time, there was really no way to be sure you were buying a Modigliani. Finally, his artwork itself worked against a lasting reputation. Because Modigliani worked to create his own signature style, he was not included in the early narrative of 20th century art. He is neither a cubist nor an abstract painter nor does he fit within any other school of art. His work stands outside the rest and was often left out of the early histories of 20th century art as a result. Fans of Modigliani, like myself, can hope that as more and more people begin to see how inferior Picasso’s work is to that of Matisse, that other excellent painters like Modigliani will be given their due. Ms. Secrest’s book is a step in the right direction. Since I first ran this review on my old blog, Ready When You Are, C.B., I remain a fan of Modigliani, but I’ve become a devote of Henri Matisse. Fortunately, we don’t have to pick one or the other, we can enjoy them all.